The Clare team join in a minutes silence for the late Clare GAA President Henry Neylon before the Waterford Crystal quarter final against Limerick at Sixmilebridge. Photograph by John Kelly. Bobby Duggan of Clare in action against Richie English of Limerick during the Waterford Crystal quarter final at Sixmilebridge. Photograph by John Kelly. 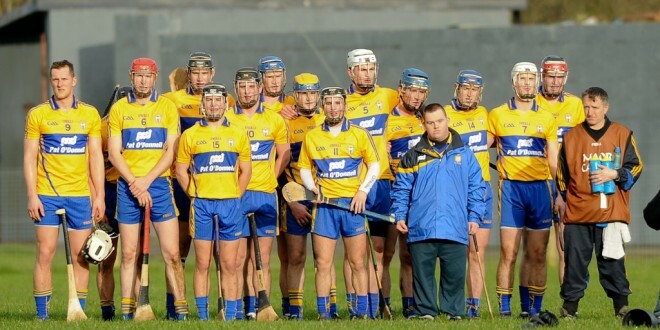 MEMBERS of Clare’s All-Ireland winning senior hurling team from last September were given a stern warning at Sixmilebridge on Sunday that they face stiff competition for their places in the squad in 2014. Making his senior inter county competitive debut, 18 year old Bobby Duggan put down a strong claim for a place in the squad with a powerful display which yielded 0-12, three of which came from play. Cathal O’Connell, a member of last year’s squad and Seadna Morey, also a member of last year’s team, laid solid claims for inclusion in the first fifteen in 2014 while Cillian Duggan, playing at full back, also staked a strong claim for a place in the 2014 squad. 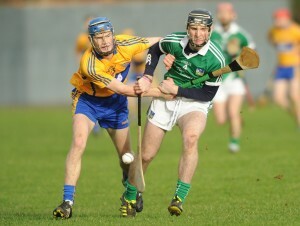 Stephen Walsh of Limerick in action against David Reidy of Clare during the Waterford Crystal quarter final at Sixmilebridge. Photograph by John Kelly. A fortunate goal inside the first minute gave Clare a lead they held throughout. 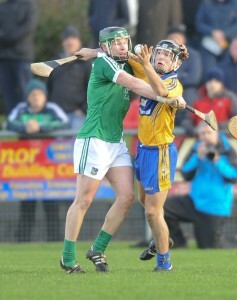 Cathal O’Connell’s effort from 60m ended up in the net via the hand of Limerick goalie Barry Hennessy. Duggan opened his account in the fifth minute, three minutes before Limerick had their first score. Clare went on to lead at half time, 1-9 to 0-6 and never lost that margin in a second half they also dominated. Speaking after the game Limerick manager T.J. Ryan questioned ‘the legality of Clare’s tackling. I was dubious about some of the tackling there today. This new Clare tackling system, I don’t know what’s the view from a refereeing point of view. When a guy loses the ball and he gets wrapped up and there is a third man coming in, is that a Waterford Crystal rule or a league rule. We will have to look at it. There is a lot of it happening”, said former player Ryan who was managing the side for the first time. 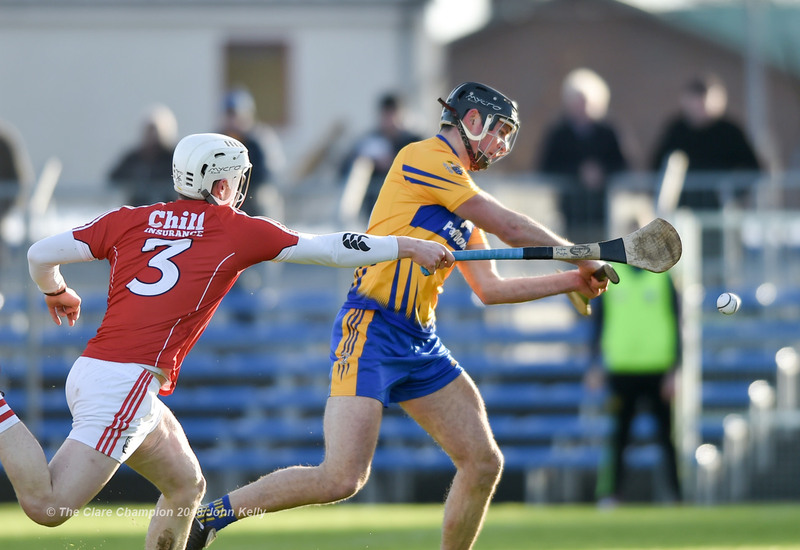 The visitors can point to a number of missed chances, particularly from frees but overall, Clare showed the greater sharpness and hunger and the winning margin is a fair reflection on their superiority. 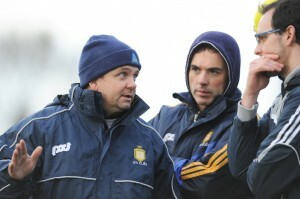 Clare manager Davy Fitzgerald with selectors Louis Mulqueen and Paul Kinnerk on the sideline during the Waterford Crystal quarter final against Limerick at Sixmilebridge. Photograph by John Kelly. “A win is a win but I wouldn’t read anything into it. Limerick had three goal chances in the first half which they missed so we were lucky enough to be ahead at half time. We played better in the second half alright. It will be interesting to see how well the lads that didn’t play today have wintered”, Clare manager Davy Fitzgerald said. “These lads are saying that they want to be in the panel and on the team. I have to drop a few in the next month and it’s going to be hard when you have lads like that who gave a fair performance today. My honest opinion is that we are going to be under pressure in the first and second round of the league. I don’t think we will have enough done. The main teams like Kilkenny and Dublin have weeks and weeks of work done and that’s a worry”, Fitzgerald added. Limerick’s tactic of playing John Fitzgibbon, named at corner forward, in the midfield and half back area failed to cause any problems for Clare who dominated in most areas. Indeed, Killian Ryan, who was Fitzgibbon’s marker, held the upperhand in this contest and managed to score a point in the opening half. Limerick—Barry Hennessy; Stephen Walsh, Philip O’Loughlin, Ritchie English; Wayne McNamara, Cathal McNamara, Gavin O’Mahony; Paul Browne, Paudie O’Brien 0-1; Darragh O’Donovan 0-1, Donal O’Grady, William Hickey 0-2; Graeme Mulcahy, Michael Ryan, John Fitzgibbon 0-5, all frees.